Top domain rankings (e.g., Alexa) are commonly used in security research, such as to survey security features or vulnerabilities of “relevant” websites. Due to their central role in selecting a sample of sites to study, an inappropriate choice or use of such domain rankings can introduce unwanted biases into research results. 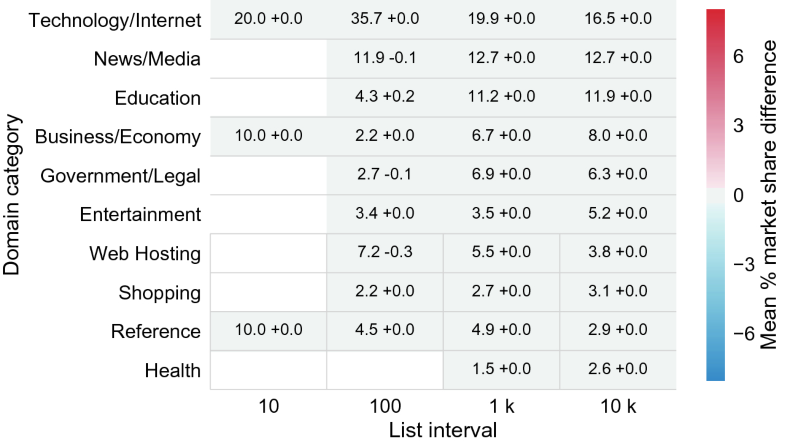 We quantify various characteristics of three top domain lists that have not been reported before. For example, the weekend effect in Alexa and Umbrella causes these rankings to change their geographical diversity between the workweek and the weekend. 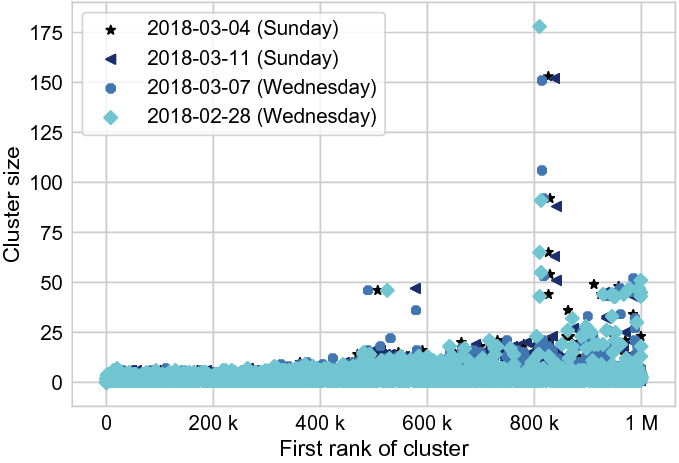 Furthermore, up to 91% of ranked domains appear in alphabetically sorted clusters containing up to 87k domains of presumably equivalent popularity. We discuss the practical implications of these findings, and propose novel best practices regarding the use of top domain lists in the security community. This work was supported by Secure Business Austria and the National Science Foundation under grants CNS-1563320, CNS-1703454, and IIS-1553088. 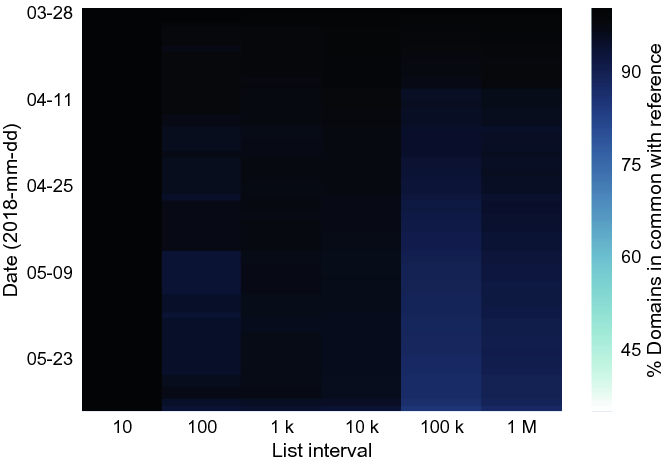 Alexa and Umbrella changes over time in exponentially increasing list intervals, using Sunday 4 February as the reference day. See Fig. 1 for full legend. Changes in Majestic over time in exponentially increasing list intervals, using Wednesday 24 March as the reference day. See Fig. 1 for full legend. Majestic is remarkably stable. 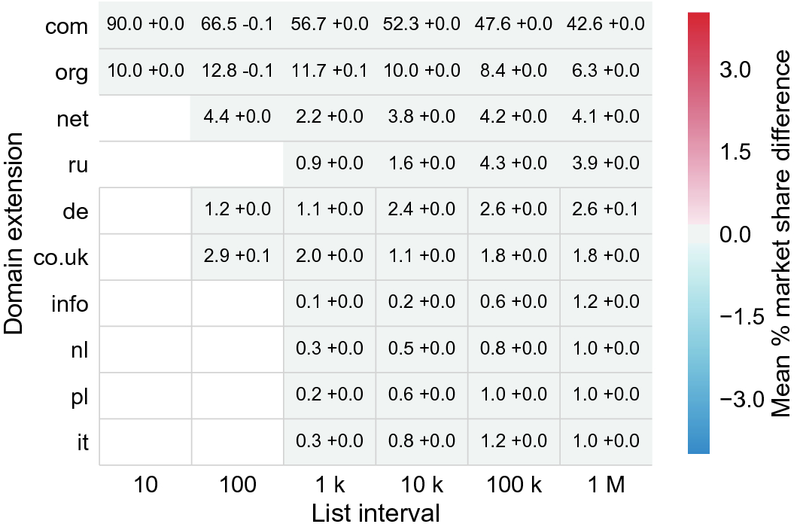 Scatterplot of each alphabetically sorted cluster’s size by its highest rank in Majestic. Partially visible downsampling of small clusters. See Fig. 5 for full legend. Majestic has only small clusters. Top 10 domains on Wed. 4 and Sun. 8 April 2018 in Alexa and Umbrella.